Four reasons why your family should celebrate Christmas on St. George Island. It’s almost that time of year again…HOLIDAY SEASON! The time when we get together with family and friends in our flashy ugly Christmas sweaters to watch the mean green Grinch and childhood shows like Charlie Brown’s Christmas while sipping hot chocolate in front of the fireplace for what feels like the tenth year in a row. Maybe it’s time for something different. Something non-traditional, like celebrating Christmas on the beach! 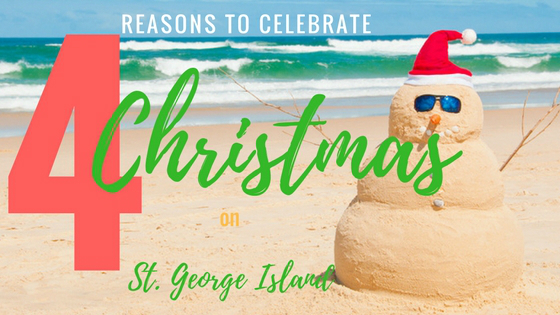 Here are four reasons why your family should celebrate Christmas on St. George Island. Traditions are what makes a family unique. They give us a sense of security knowing that together, there’s a shared interest. Family traditions create priceless memories that will have you itching to tell others about. Let this year be the year your family starts a new family tradition by celebrating Christmas on sunny St. George Island and build memories generation after generation. The kids are sure to love this idea, and they’ll go back to school with the best Christmas vacation story ever! No need to worry about people crowding the beach. This is the perfect time for the whole family to be together and enjoy one another; like taking a nice stroll on the island’s crystal white 27-mile long beach. The weather should be pleasant, probably too cold to get in the water, but fine enough for a beach picnic, making ‘sand snowmen and snow angels’, and having friendly competition playing “reindeer games.” So don’t forget the badminton and volleyball set. Enjoy being creative and coming up with different ideas together. For example, if your family is really crafty, use this time to come up with a list of fun family DIY projects to complete for the new year. While on your stay, use the well-equipped kitchen to make yummy, jolly holiday treats for old St. Nick. There are neat DIY activity and holiday food ideas on our Pinterest page. Want to see how others on the island are showing their Christmas Spirit? Then, you would love the Holiday Lights Contest. Businesses and homes are decorated with twinkling lights, Christmas palm trees and you may even see an illuminated boat or two. This event goes on until the end of the month and the winners will be announced on December 21st. Visit the local shops to find wonderful coastal holiday trinkets or gifts for your friends back home and you must stop by Weber’s Little Donut Shop for the most unique, delicious donuts you will ever eat. Tell them we sent you! Christmas outdoors…comfortably, sounds like a blast! No snow, no black ice, or bone-dry hurting cold. Only sand, the gulf, and nature at its finest. Have you heard? There’s treasure on St. George Island! Take the family geocaching and find out where Pirate Captain Bowels buried his treasure. Read our blog on geocaching to learn more about it on the island. While you’re searching for that treasure, be on the lookout for painted rocks. Visitors and locals alike, paint rocks and hide them around St. George, a trend that started with The Kindness Rocks Project and has gone viral. If you find one, simply take a picture of it and post it on social media. What’s even more awesome, is you can do it too. Paint and hide a rock and try to find it on your next visit! And if you like coffee, then you will love Coffee in the Campground at the St. George Island State Park. Park rangers will give an interpretive presentation and provide more information about wildlife on the island. Try something uncommon, escape the frigid tempts and take your family to St. George Island this holiday season. Instead of a Winter Wonderland, create a ‘Sandy Christmas Vacation’ and enjoy precious moments with the ones you love. Paint a rock and leave it behind….for next time…on the Forgotten Coast. Let’s Start a Tradition. View our Specials!